As is often the case at conventions, I got too involved in actually running or playing games to take many photos, but here’s a few pics from GottaCon 2013! These are all over on Flickr in my GottaCon 2013 Photoset. Friday evening Corey ran and I played his homebrew fast-and-simple pulp racing game. You can read my Friday writeup for details, but basically it was Our Hero being chased by Evil Henchmen down a narrow, twisting country lane. Sheep, other traffic, skunks and an elephant got involved, and pretty much everyone crashed. 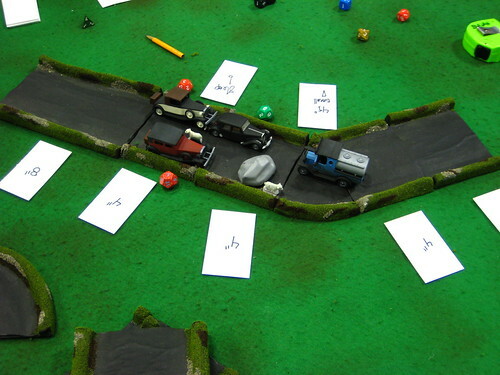 Friday night’s pulp racing game. Our Hero in the black car, two Henchpersons in the red & white cars, innocent but explosive NPC fuel truck getting in the way. Click to see larger over on Flickr. Saturday morning I played a naval board game with a friend I hadn’t seen in at least four years. Great to reconnect with him again, and totally random – I just happened to wander by the board gaming area looking for something to do, because there was nothing in the miniatures or RPG area I was interested in! Saturday afternoon was, of course, the first running of my Russian Civil War game. See Saturday’s writeup for a few more details; I’m also going to be posting a more detailed writeup on the two games later this week, because from identical starting positions involving identical forces over near-identical terrain, they wound up radically different games! 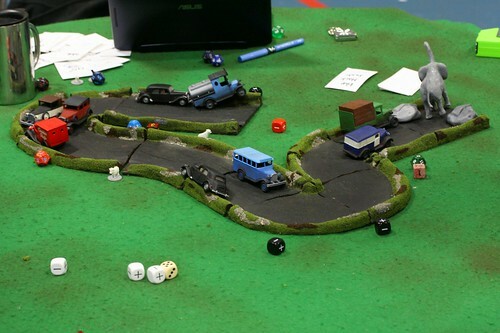 I didn’t get any photos of the second game on Saturday evening, but the terrain involved changed only very slightly, so this overall table view will work for both games. 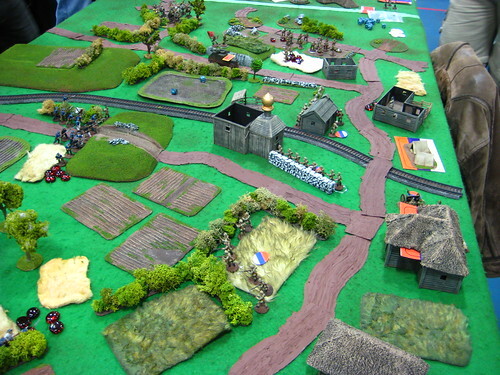 Looking down the length of my Russian Civil War table. Reds started on the long left edge; the Whites started in the hamlet ahead of the camera. As you can see, I’m a great believer in getting maximum table coverage, even if it’s just open fields with minimal effect on play! Click to see larger over on Flickr. Sunday morning Corey and I wound up re-running his pulp racing game, with rules slightly tweaked after discussing Friday’s game. We have a draft system for vehicle damage, which is fun and adds to the tension and chaos. Sunday morning’s racing game, with Our Hero in the blue-and-white truck getting clean away to see the elephant. Best not to ask why an elephant, really. Click to see full-sized over on Flickr. Sunday afternoon I played a short demo game of Infinity. The system is interesting, but the terrain being used was fairly bland, so I didn’t bother taking photos. So that was GottaCon 2013! Same again next year, only more of it – as I said in my Sunday writeup, I’m pretty sure we’ll both be running more games next year, just to get the kind of gaming we like represented!